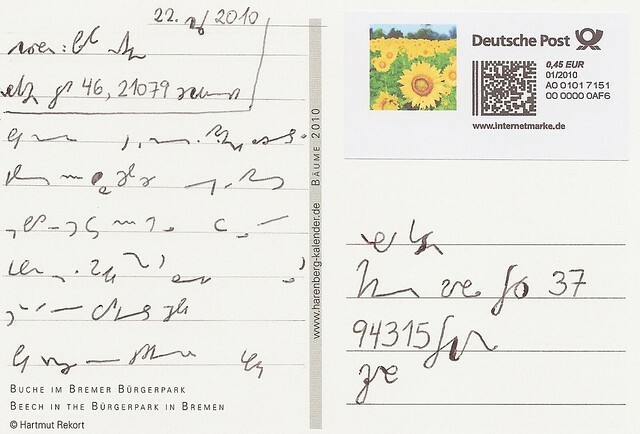 Today, I sent a postcard to my shorthand teacher, addressed entirely in shorthand. Edit 2010-09-10: it arrived! I used the Verkehrsschrift (basic grade) of DEK (German Unified Shorthand) for the sender and recipient addresses, since if any postal employee learned shorthand at all (which is what I’m wondering, and which is the point of this experiment), it’ll be DEK. The message itself is in Aufbauschrift II (commercial grade? *) of Stiefografie, which is what I learned. I used a DEK dictionary to help me compose the addresses, since (a) I never formally sat down to study it, and (b) I find it rather complicated, and its abbreviations—even in the lowest “grade”—fairly numerous. * The basic grade of Stiefografie is a lot simpler than that of DEK: it has no abbreviations at all, only a few signs for certain consonant combinations (nd/nt, ng/nk, st, sp, pf). Personally, I find that the second grade of Stiefografie is roughly comparable to the basic grade of DEK, and the third and highest grade of Stiefografie to the second/middle “commercial” grade of DEK. This, based on the number and kind of abbreviations used (which are very often very similar: I suspect that Helmut Stief used DEK Eilschrift as an inspiration in deciding what forms to abbreviate and how to do so). So Stiefografie has nothing to compare to DEK’s highest “speech” grade, suitable not just for dictation but for notating spontaneous speech. Please keep us updated whether it arrives. The recipient will be on holidays for the next couple of weeks (they still have school holidays where he lives, and he's a teacher), so I'll have to wait a while anyway. I'll see what happens. The automated sorting machines will have had a field day. I wonder how good they are at handwritten addresses in general -- what proportion of hand-addressed mail the OCR systems can handle by themselves and what proportion has to be sorted by hand. I did try to write as neatly and legibly as possible, but of course, shorthand is not what they're trained for :) But perhaps it'll help a postal worker who happens to know some shorthand if he doesn't have to decipher a scrawl. 4: Is 17 the most random number between 1 and 20? 6: I can speak Esperanto; the test says so!